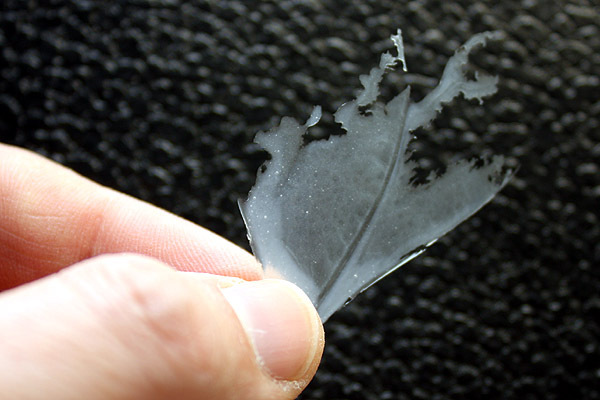 Leaf of a plant, white wood glue (PVC glue etc., water soluble), slides, scissors. Evenly spread a drop of water soluble wood glue on the bottom side of a leaf (the stomata are located on the bottom side). Wait several hours or overnight for the glue to dry. Carefully peel off the glue. It has become transparent. Use scissors to cut the glue into shape and observe under the microscope. 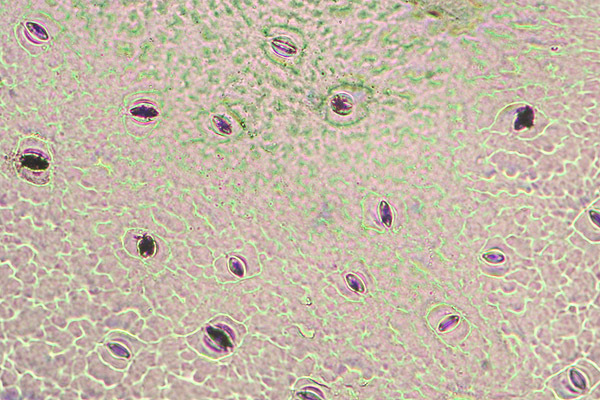 The leaf epidermis cells have left an impression on the glue, which can be observed. Solution: Spread the glue on an even section of the leaf underside. Some leaves may have microscopic hair, which have become attached to the glue. Problem: Nothing can be seen. Solution: The contrast of this specimen is very low. You have to close the condenser aperture diaphragm to increase contrast. Problem: The resolution is low. Solution: This is due to the fact that the specimen (the dried glue) is not embedded in water and a cover glass is missing. Either make a permanent mount in with a non water based mounting medium or try to use glue which is not water soluble anymore after it has dried. 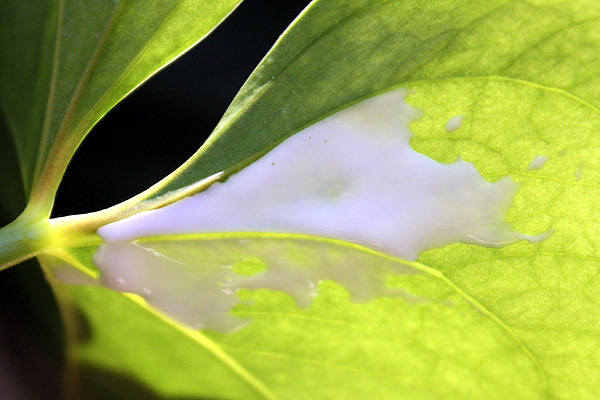 Do not cover the whole underside of the leaf with glue, this will block gas exchange and may harm the plant. Do not use glue with organic solvents (acetone, alcohols etc.). This will possibly harm the leaf and these solvents withdraw water from the cells and dissolve the cell membrane. Or: try it anyway, maybe it still works… Take care that the glue does not contain solvents that are harmful when inhaled. Spread the glue at night (do not turn on the lights) and compare the shape of the stomata with those during day. The stomata of the “daytime glue” should be open, the stomata of the “night time glue” should be closed. Compare the size and shape of the leaf epidermis cells of different plants. Does the size of the leaf have an effect on the number of stomata, on their shape? Approximately how many epidermis cells are there to one pair of guard cells? Wikipedia explanation of stomata and guard cells. Evenly spread a thin layer of water soluble wood glue on the bottom side of a leaf. When the glue has dried completely, carefully peel off the glue. It should separate easily from the leaf. The leaf has left an impression on the glue. Cut the glue into shape using scissors and observe it with the microscope. If the glue is still water soluble after drying, then do not immerse the glue into water. The contrast is low, it is necessary to close the condenser aperture diaphragm.